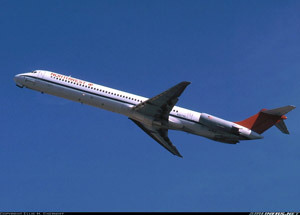 Northwest Airlines, Inc., Flight 255, a McDonnell Douglas DC-9-82, was a regularly scheduled passenger flight en route from the Detroit Metropolitan Wayne County Airport, Romulus, Michigan to Phoenix, Arizona. At approximately 2046 on August 16, 1987, Flight 255 crashed shortly after taking off from runway 3 C. According to witnesses, the airplane began its takeoff rotation about 1,200 to 1,500 feet from the end of the runway and lifted off near the end of the runway. After liftoff, the airplane rolled to the left, rolled to the right, and then collided with obstacles northeast of the runway when the left wing struck a light pole located 2,760 feet beyond the end of the runway. Thereafter, the airplane struck other light poles, the roof of a rental car facility, and then the ground. The airplane broke up as it slid across the ground, and post-impact fires erupted along the wreckage path. Three occupied vehicles on a road adjacent to the airport and numerous vacant vehicles in a rental car parking lot were destroyed. All six crewmembers and 148 passengers were killed; 1 passenger, a 4-year-old child, was seriously injured. On the ground, two persons were killed, one person was seriously injured, and four persons suffered minor injuries. The National Transportation Safety Board (NTSB) determined that the probable cause of the accident was the flight crew's failure to use the taxi checklist to ensure that the flaps and slats were extended for takeoff. Contributing to the accident was the absence of electrical power to the airplane's takeoff warning system, which failed to warn the flight crew that the airplane was not configured properly for takeoff. The reason for the absence of electrical power could not be determined.